GD Rectifiers offers a thermal paste, SCX-13 to customers. The thermal compound is manufactured with a unique grease compounded from custom refined low sulphur oil. The grease base ensures brushability over a wide temperature range, tenacious adherence to all surfaces, resistance to water wash out and the prevention of rust and corrosion. This makes the product easier and more reliable to use. 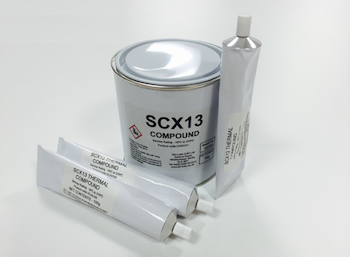 GD Rectifiers have limited stock available of the SCX-13 paste at their factory, once existing stock has depleted, GD Rectifiers will be replacing the thermal paste with a similar alternative. GD Rectifiers is a global manufacturer and distributor of products, services and solutions to commercial and industrial users of power electronic components. GD Rectifiers designs and manufactures selenium and silicon rectifiers, suppressors, inverters, regulators and all other power products for industrial power control applications. The company distributes state-of-the-art semiconductors, including: diodes, thyristors, IGBTs and MOSFETs from the world's leading manufacturers including: IXYS, IXYS UK Westcode, Semikron, Dynex and EDI. GD Rectifiers manufacture an extensive range of power components and assemblies. The company also supplies a wide range of heatsinks suitable for power semiconductors, LED lighting and similar applications. GD Rectifiers also offer a repair and replacement service for faulty or ageing semiconductor rectifiers, inverters and regulators.